We all want it to be the satisfying. Sometimes we need more than our imagination. We Vibe offers couples and solo sexual products to enhance your enjoyment. 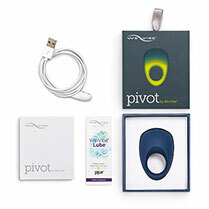 Pictured on the right is the Pivot, a device for couples. Other options are available. After all, if you can't talk to your gynecologist about your sexual health who can you talk to?